Good morning! It’s Wednesday, folks. I can see the weekend in the distance! Today I have one of the Summer Duos from Dior’s 2013 Bird of Paradise Collection. There are two sets available. I’ll be showing you the Samba Duo. These are mini bottles (7ml), which is 70% of the full-sized Diors. The two polishes in the pair are packaged together in a single box. 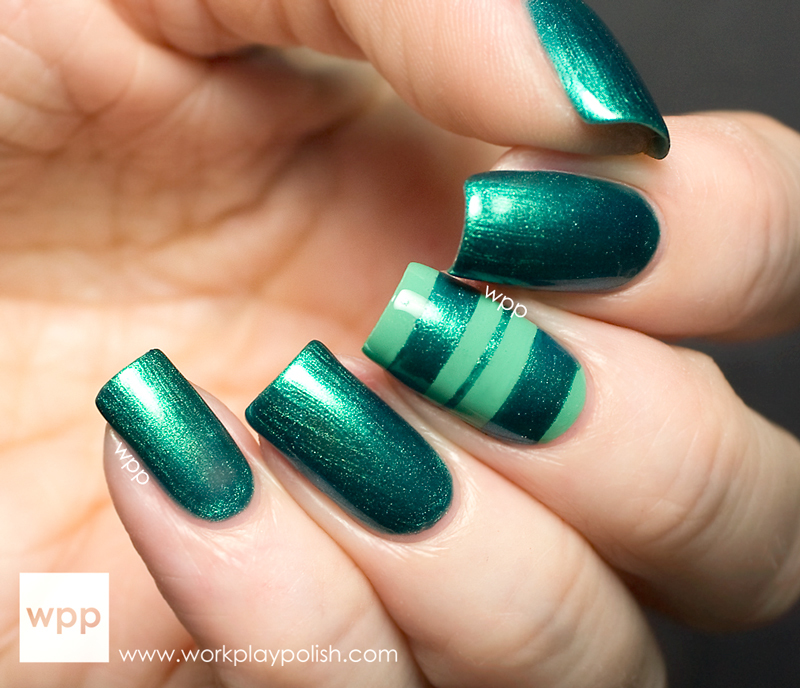 I striped my middle finger for both swatches so you could see the pair together. They really are a nice complement to each other. Dior describes Samba (402) as a “sea blue”. The color says “seafoam green” to me rather than “sea blue”. I prefer a brighter teal, but it’s still a beautiful color. It has Dior’s signature crème formula, which I’m crazy about. I used two easy coats. Both swatches are finished with a coat of Seche Vite. Samba (794) is described as a “metallic peacock green”. It’s really beautiful, but I immediately thought of Chanel Azure. It turns out that Azure is a little bluer and 794 is greener and not as shimmery. They definitely aren’t the same, but you probably won’t want/need both…so compare them before you buy. The formula was excellent. It was sheer on the first coat and fairly opaque in two. You can see some slight balding in my pinky. I could have gone for a third. Dior never disappoints me. Their polish is a real splurge but I never regret it! The Bird of Paradise Dior Vernis Duos retail for $29. That’s actually a deal. Full-sized Dior polishes (10ml) retail for $24 each. So you’re really getting over $33 in polish for $29. I purchased mine at Sephora. You can also find them at dior.com, Nordstrom, Macy’s, Dillard’s and other fine department stores.